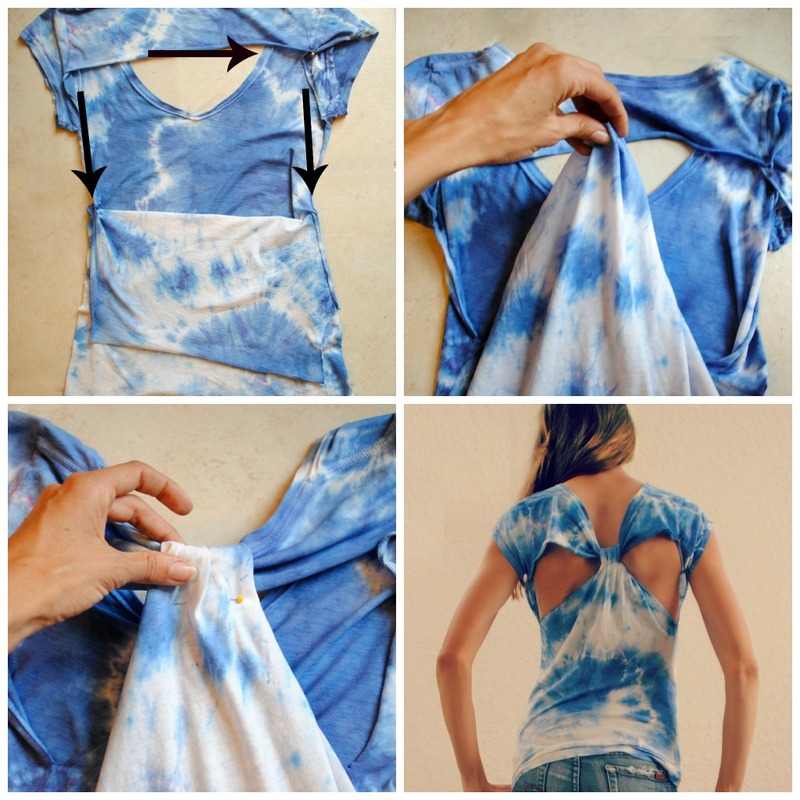 Trash To Couture: DIY T Shirt Refashion. Quick tutorial below takes 5 minutes. Cut as shown in the picture. I started in the middle of the sleeve seams but don't cut the sleeves off. Cut along the side seams as far down as you'd like to go. The more you cut the more skin. Grab the extra fabric and wrap around the top collar part. Pin it to loop around and sew right along the pin. I always wonder this about open backed shirts and dresses: what do you do about a bra? I love the open-backed look, but I'm not really able to go braless...have any tips? Thanks! I ended up buying an open-backed shirt today, interestingly enough. Bandeaus are cute for open shirts like this! I love how you have the dyed everything! This is simple enough for me to try I think! This turned out super cute! Thanks for sharing! I definitely need to pull out some of my boring tshirts and give them a makeover. i will say that i was also concerned with the bra 'situation,' but now that i have done this with 4 of my old tees just for hiking, i notice that my racerback sports bras were completely invisible underneath! YAY! this was a good simple tutorial, I did it and it turned out really well!! good way to finally wear all those blah t-shirts you get from every event but don't want to get rid of. Thanks!! coincidence really but I was looking on your blog and found this post and I was like OMG that is the DIY t-shirt tutorial I pinned on Pinterest. And it got (so far) 2010 re-pins and 338 likes so i'm definitely saying it came from your blog! In my opinion, it will be great idea for students to read https://admission-writer.com/blog/how-to-write-a-scholarship-essay You can write great scholarship essay using these advices.